Girl Meets India: Is India Safe? When I first moved to India, the question I always got asked by my family was 'Do you feel safe there?" Even now when I am meeting a fellow expat for the first time or one of Matt's co-workers, that's always something they ask. All you have to do is open a newspaper, or that handy iPhone app you have, and you'll likey see a terrible story about hate crimes towards women. Women being senselessly raped and murdered, young girls set on fire over land ownership. I recommend you watch the documentary It's a Girl and visit the website here, to see the trailer. The statistics on gendercide is Southeast Asia is astounding. So to answer your question of if I feel safe here...yes, actually I do. But the fact that I feel safe is largely attributed to the conscious choices I make, and sadly is mostly due to my socioeconomic status. Many hate crimes towards women, including the latest crimes in the Katra village, occur when women are using the bathroom. If you haven't gotten around to watching the news and don't know what I'm talking about, you can read the most current CNN article here. In this particular village, women were only allowed to relieve themselves early morning or at night in the dark, because they were to not be seen by men. However, when you have to use the bathroom in a deserted field, you are making yourself very volnurable. I am lucky enough, however, to always have access to toilets, or at least a squatty potty with a lock. To put it into perspective, more Indians have cell phones than access to toilets or what is referred to as "improved sanitation." I have read several news articles with varying statistics, but about 50% of households have cell phones, while only 35-45% of people have access to a toilet. Remember that video I shared with you "Take Poo to the Loo?" That wasn't a joke! I feel worried for this country because they still have such a long road ahead of them in terms of improving the health and safety for everyone. I wish there was a quick fix, but the fact is that India is just a young pup of a country, and until the corruption is put under control, nothing can be changed. Sorry for being so gloom and doom. However, if you are traveling to a foreign place, here are some of my tips to stay safe. You don't have to be in a third world country to use them. And again, please don't think I take anything for granted. Just because I don't worry about my safety 24/7 doesn't mean I don't take every precaution possible to keep it that way. 1. If you are a woman, especially in an unfamiliar place, do not go out alone at night. I know some people would think it's being overly cautious, but that is something I absolutely will not compromise. 2. If you're getting into a taxi or auto-rickshaw alone and feel uncomfortable, before getting in stand at the back of the car and make a phone call, to anyone. Tell someone the drivers name and the license plate number. Even if no one answers or you're not able to make calls, pretend. Making the driver aware that you have reported this information is the point. 3. In order to do number two, make sure you purchase and carry with you a portable phone charger. You don't want to be in a situation where you can't make calls, or play Words With Friends. 4. When you're shopping at markets you'll get lots of offers to come to the back room to see the "good stuff." Don't go. 5. Be aware of your surroundings at all times. This can be difficult in crowded areas, but make sure you know who's around you and where your belongings are. 6. I read this one in a travel guide...if you feel as though you are being followed, look that person directly in the eyes and ask something like "Do you know what time it is?" Someone with bad intentions is less likely to mess with you once you have identified them. 7. Lastly, trust your gut. If you're unsure about something, don't do it! Always trust your instincts. *You've probably noticed the design of this blog has changed several times. I am officially obsessed with changing the colors and layout until it is just right! I have gotten some complaints about the dissapearance of the elephant background. While it was a beautiful picture, it was distracting from the text and my own photos. I appreciate your patience while I fine tune things. I get asked this a lot as well. And for the most part I do feel safe but again, I live in a semi decent part of the city around well educated professional types. I just hope Modi follows through with his campaign promise of "toilets not temples". All of these are great suggestions. Coming from UP, one the scarier states in India for women, I will add this for women travelers. 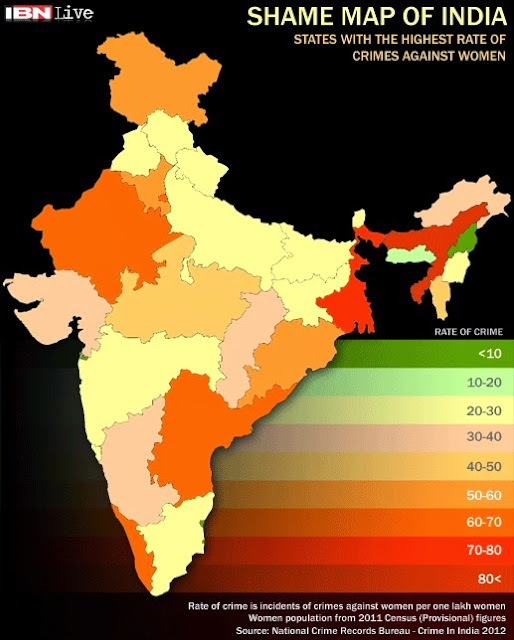 Yes, India is hot but cover it up please. You will be getting more than enough attention due to your lighter skin and where you come from, you don't need to draw the extra attention to yourself. Many here have a preconceived notion about "foreign" women thanks to Hollywood so lets keep it classy and leave the short shorts and tank tops at home. Oh, and no need to smile at everyone you see. Women and children are fine but no smiles to random dude on street who catches your eye. It is an invitation you probably don't want to send out. Thank you so much for mentioning that! I am so used to wearing my high school t-shirts and sweatpants that I completely forgot about it. I attempted to wear some local Indian clothes at first, but I just felt I was making it worse. The goal: attract as little attention as possible!